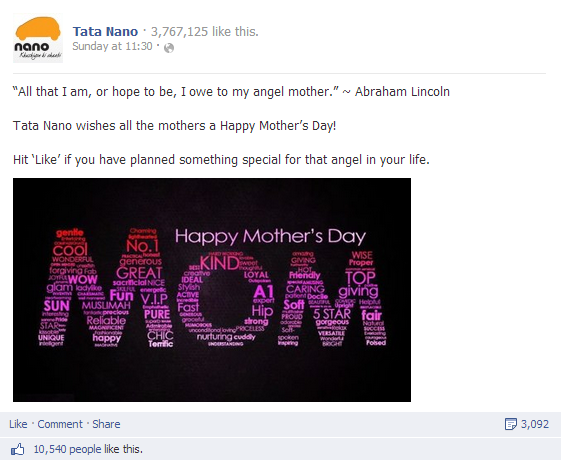 A list of the 10 most engaging mother's day Facebook posts by Indian brands. Last weekend could officially be branded as The Mother’s Day weekend. Very few brands designed entire Facebook campaigns on this occasion, while most of them celebrated with visual content updates or kept their faith on Twitter. More than 9 hashtags dominated the India trends on Twitter. On Facebook it was more about visual updates expecting to soar engagement. In fact some did! 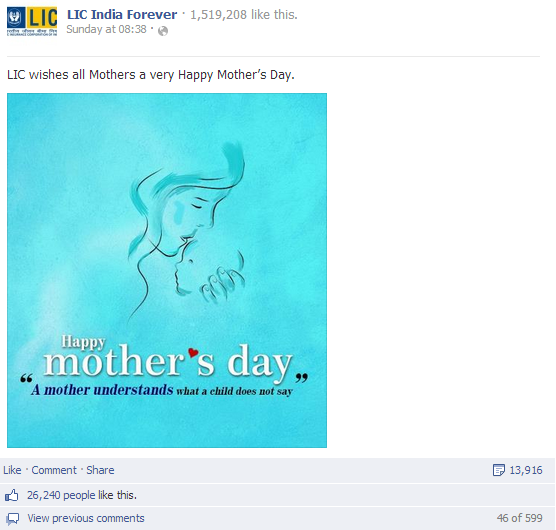 Using Unmetric we have pulled out the 10 most engaging Facebook content posted by brands during Mother’s Day. Weightage has been given to shares, then comments and then likes. Since every brand wanted to cash in from the event, we considered those brands who had 2.5K and more shares on their content. 1. 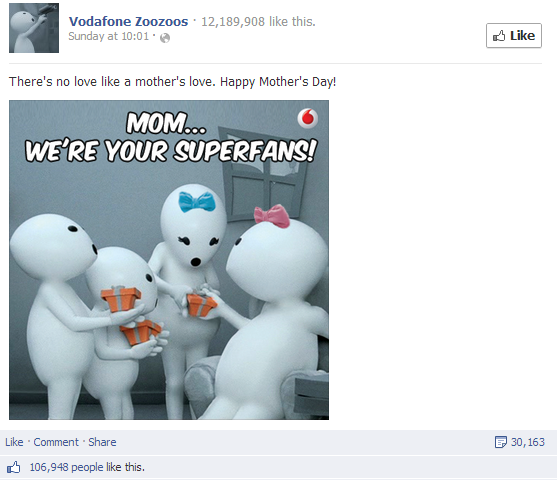 Vodafone Zoozoos (U=84): The most adorable brand on Facebook atleast for it’s funny characters – Zoozoos made sure that they brought a smile on the faces of their fans. With more than 12M fans, the brand posted a content on Sunday around 10 A.M. which has received more than 30K shares and got more than 2K people commenting on the post. The content also received more than 100K likes making it the most engaged content on the page in recent times. According to Unmetric, the engagement score was 1119. 2. LIC India Forever (U=51) : The largest life insurance corporation of India – LIC which has more than 1.5 million fans on Facebook wished fans on the occasion. The brand uploaded a visual of a mother and child reflecting the emotional bonding of both. The content was posted on Sunday and has received more than 13K shares. The content also made more than 500 people comment on the post and another 26K people liked the post too. The engagement score is 1216. 3. 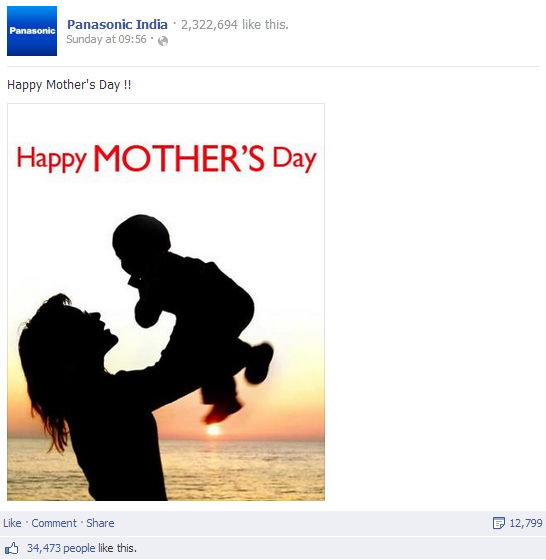 Panasonic India (U=55) : The electronics brand which has more than 2.3M fans on Facebook, didn’t miss out on this opportunity. The brand uploaded a visual content of a mother and child. Even though the content looked quite amateurish from a design point of view, it was shared more than 12K times and got more than 600 people talking on it. The content also received more than 34K likes with an engagement score of 937. 4. Save The Tiger (U=69) : The community that vows to save the Tigers also chipped on this occasion but in a very nice way. 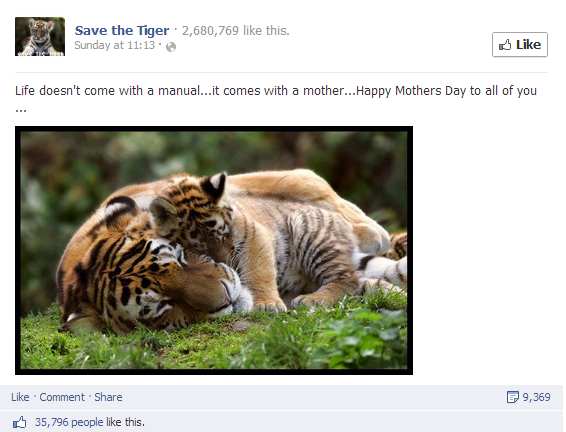 The community that is 2.6M strong, shared a visual content of a tigress with her cub. The visual had the emotional connect and aligned to the objective which got more than 9K people sharing it. In addition to this, more than 500 people commented and another 35K people liked it. The engagement score was 711K. 5. Aircel India (U=54) : The mobile operator of the country which has more than 4.1M fans on Facebook, didn’t miss out on the occasion The brand uploaded a more or less similar content of a mother hugging her child. However, the post also asked fans to describe their mom. The post got more than 6K shares, more than 600 people commented and another 24K liked the content. The engagement score was 399. 6. 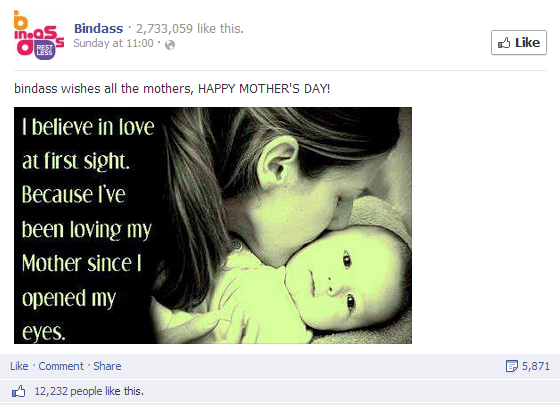 Bindaas : The India TV channel which targets the youth joined in the celebrations of mother’s day too. The brand posted a visual content which reflected the love for a mother from a child. The content was shared by more than 5K people and got more than 12K likes. The content also made more than 278 comment on the post. 7. 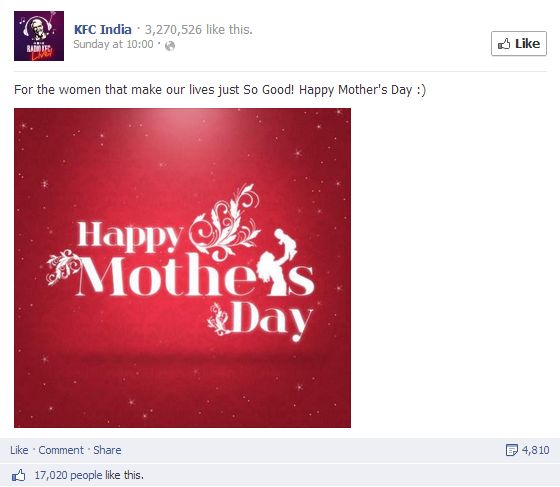 KFC India (U=51) : The fast food brand also made sure that it wished its fans on Mother’s Day. The brand that has more than 3.2 million fans on Facebook, created a simple but an appealing mother’s day visual. The content was shared more than 4K times, got more than 289 people talking and was liked by more than 17K people. The brand engagement score was 317. 8. Tata Nano (U=50) : The common man’s car – Tata Nano has more than 3.7M fans on Facebook. The brand made sure it wished its fans on Mother’s Day. Along with a visual content, the brand shared a thought from Abraham Lincoln too, “All that I am, or hope to be, I owe to my angel mother.” The content was shared by more than 3K people, commented by 166 people and liked by another 10K people. The engagement score was 184. 9. 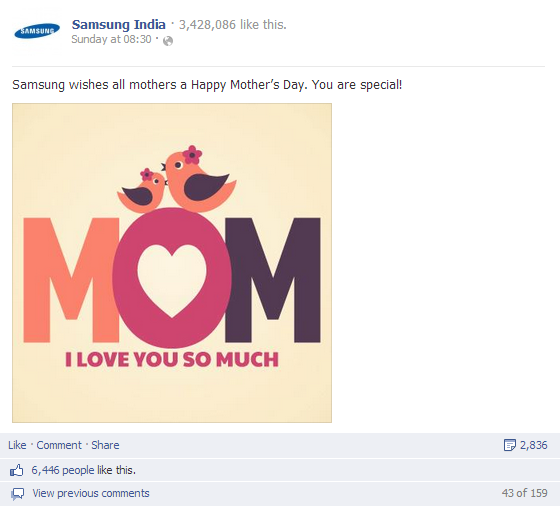 Samsung India (U=42) : The technology company with more than 3.4M fans, wished them on mother’s day. The brand posted a very cute visual content that expressed love for a mother. The most engaged content in the recent times was shared by more than 2K people, commented by 159 and was liked by another 6K people. The engagement score of the brand was 155. 10. 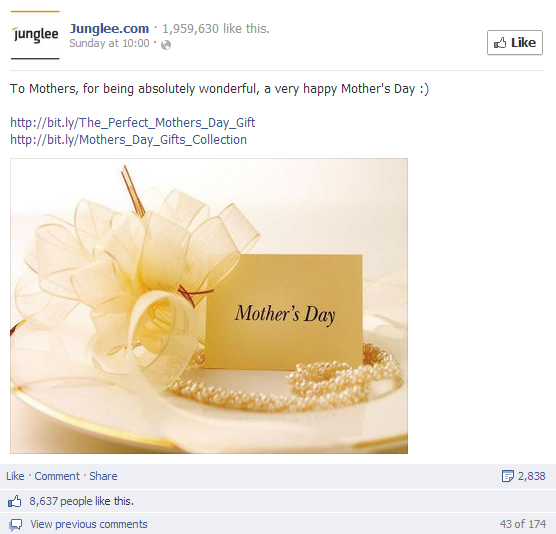 Junglee (U=39) : The ecommerce brand over the time has grown a hefty presence on Facebook with 1.9M fans. The brand shared a mother’s day message with its fans. The visual content wasn’t that appealing and it was the only brand to market on the special occasion. The content was shared by more than 2K people, commented by 159 and liked by more than 7K people. The engagement score on the content is 215. ‘U’ in the article represents the Unmetric Score that has been given by the social media brand monitoring product and it is a proprietary score. Among these, Zoozoos, Save the Tiger and Samsung India stand out for me. How about you? Do share your thoughts in the comments.